Cut the Rope from Chillingo is an iPhone game with a unique twist on Fruit Ninja. You use your finger(s) to slice and dice swinging and elastic ropes attached to a piece of candy. The goal is to get the candy ball into the mouth of a hungry green frog. If you’re looking for the type of game that will keep you hooked for a long time, Cut the Rope is definitely a good choice. You’ll be synchronizing pulling a rubber band just enough to pull and snap in perfect angle while swinging to catch a bubble going the right direction to avoid hitting spikes and get caught by another rope that you cut off to get the candy into the frog’s mouth. The game is divided into a series of five levels which are presented as gift boxes (cardboard box, fabric box, foil box, gift box, cosmic box) Each level has 25 stages with increasing complexity and adds new types of tricks as you go along. Levels are unlocked as you finish the previous one. At some point you also have to grab enough stars to qualify for the next level. For example I’m right now stuck on level 3 and need 190 stars to unlock the next level pack. Speaking of stars each stage has a maximum of 3 stars for you to capture. Getting all the stars per level isn’t easy, to say the least. 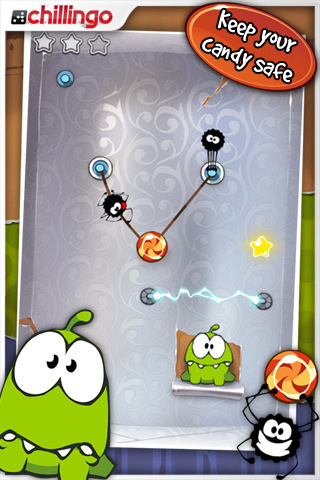 Cut the rope is like a version of Angry Birds but with a lot more challenge and a lot more patience required to get through levels. But when you do, the reward feels great too. The silly joyous background music adds a happy holiday feel to the game. Cut the Rope is the standard example of a perfect iPhone game with equal balance of replay ability, challenge, excitement and value. If you have not picked it up yet, do so immediately. Truly a masterpiece by Chillingo and zeptolab. 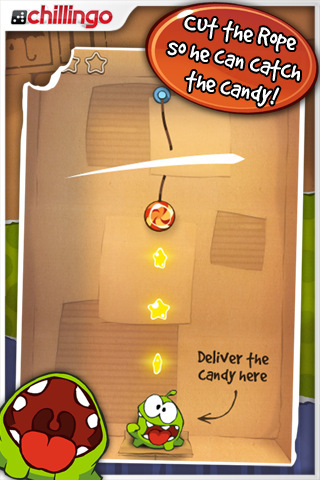 You might even end up putting Cut the Rope on page 1 of your iPhone for a while. AppSafari review of Cut the Rope was written by Joe Seifi on December 17th, 2010 and categorized under App Store, Featured, Fun, Games, Physics Based, Puzzler, Strategy, Time Management. Page viewed 5187 times, 1 so far today. Need help on using these apps? Please read the Help Page.